This is our reference NY-17273. Welcome to this fully furnished two bedroom apartment in Clinton Hill. You will find it at the corner of Grand Avenue and Putnam Avenue in the New York City borough of Brooklyn. 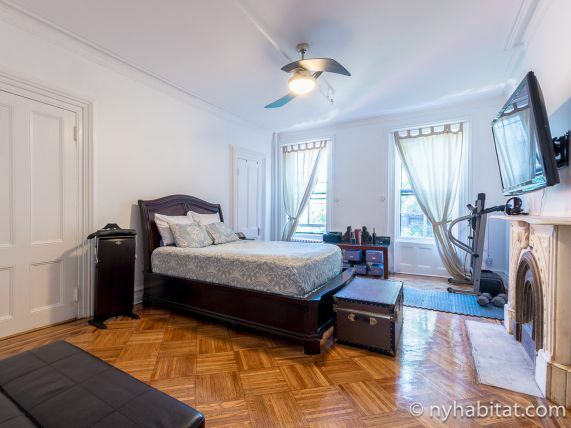 It is located on the 2nd floor walk-up (considered 1st in Europe) of a beautiful brownstone. 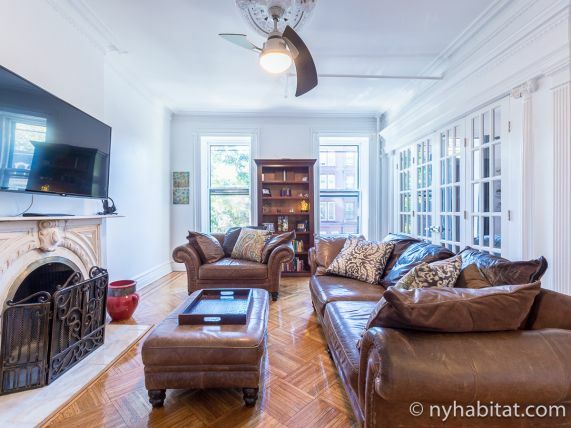 The cozy living room features wall-to-wall hardwood floors and is tastefully decorated. 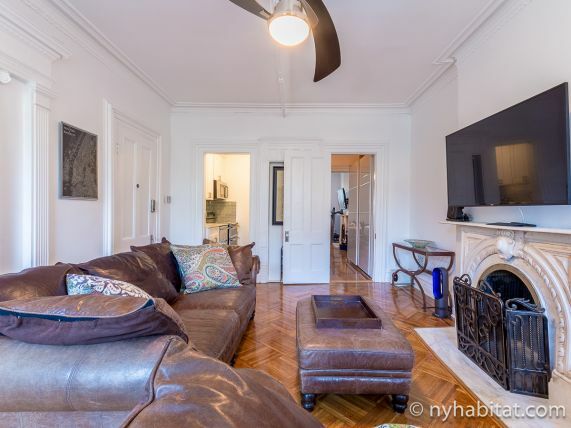 Relax on the brown sofas and watch a movie on the wall-mounted Apple TV. A decorative fireplace adds charm to the room and natural light is pouring in. 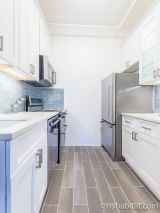 In the kitchen, you will find stainless steel appliances, a dishwasher, a coffee machine, a toaster and all the necessary cookware and dishware. Additional features in the apartment include a treadmill, printer, shredder, and a convection oven. 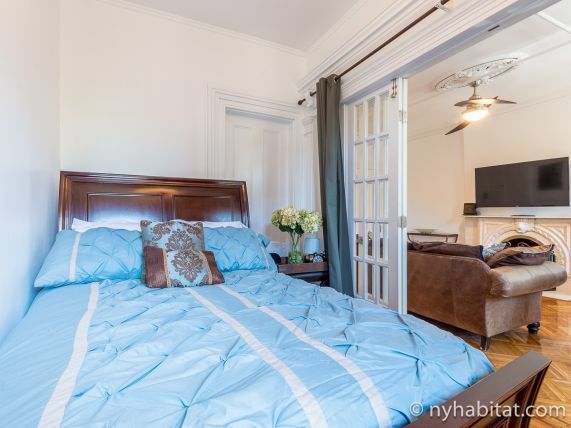 French doors will take you from the living room to Bedroom 2, which features a double-sized bed and a television. 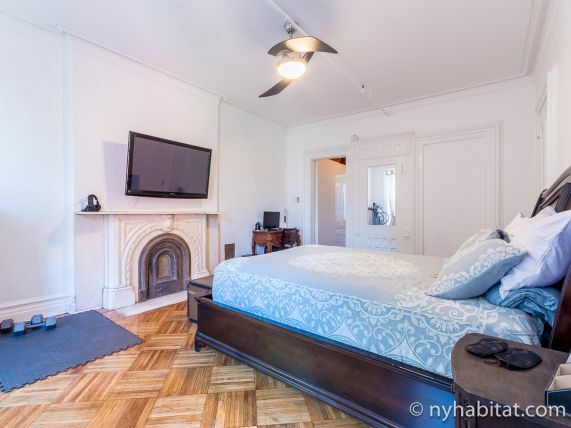 Bedroom 1 is located on the other side of the apartment and offers a double-sized bed, a television and a decorative fireplace. 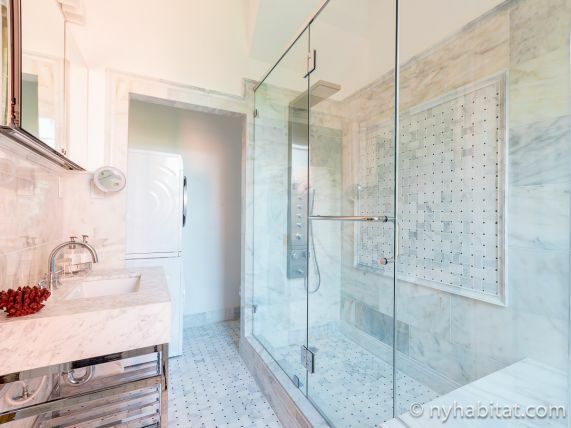 A door leads to the bathroom and its marble walk-in shower with rain shower head, heated floors and heated towel rack. Around the corner, you will find a washer and a dryer. Please note that the only way to access the bathroom is through Bedroom 1. Clinton Hill is a neighborhood in north-central Brooklyn known for its many brownstones, cafes, beer gardens and trendy boutiques. Start the day at Outpost (0.1mi/160m), a coffee bar where brews are organic, with garden seating out back. Milk River (0.3mi/480m) is a festive eatery with a lounge upstairs serving Caribbean eats. In summer, check out the Habana Outpost (0.8mi1.2km), a popular order-at-the-counter eatery with Mexican-Cuban fare. In winter, the Union Hall (1.6mi/2.5km) will keep you warm in its library-like décor and basement featuring live performances. A few blocks away, the Atlantic Terminal Mall (0.9mi/1.4km) features a variety of stores and dining options and serves as a transportation hub. Franklin Avenue/Fulton Street Subway Station (0.4 mi/650m) services the A and C lines for easy commute to anywhere in the city. Heat, Water, WiFi and Cable included. Electric and gas not included.